Cancellations must be done minimum 5 days before arrival, otherwise the first night will be charged. Please inform us about the time of your arrival in advance. Thank you! 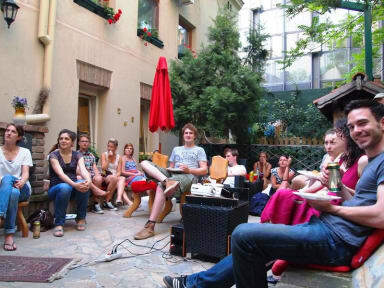 Hedonist Hostel is located in the absolute city center in a house with a with a lovely garden where guests get to know each other, relax, make barbecues and often watch concerts and live sports events on the video projector screen. The common areas are spacious & cozy and are decorated in a unique traditional style (there’s a living room and a kitchen/dining room right next to it - both connected with the garden). It’s the kind of place where it’s easy to make friends, both with fellow travelers and the staff (at least that’s what we’ve been told!). Our aim is for our guests to enjoy Belgrade and their stay with us to the fullest. Within 5 minutes on foot you will find yourself at any of the top Belgrade attractions. 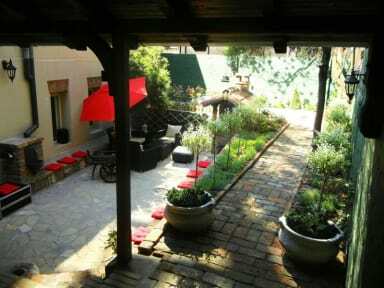 Hedonist Hostel is in the center of Old Town and is located in a very quiet one-way street. It is never noisy, yet if noise is what you’re looking for you’re only several minutes away. Belgrade city center is a very vibrant and busy place and you’re at the best possible place to truly experience it! Boss man is THE man. Hostel is located in a great area, everything is within walking distance if not get ,car:go- go anywhere, the app( its like uber, and super cheap, reliable, safe). Hostel is clean, and staff were immaculate regarding questions and accommodations. Most def recommend the free walking tours nearby. Get turnt. Did Boss man teach me to say, "I was born in Brazil?????" All the females kept saying that's what it meant...Anyway, fasho I'll be back. First website review I've ever left - this place is great, beautiful layout and common area / garden, awesome people working here, and good vibes all around. What a great hostel in Belgrade. Very nice staff with a warm atmosphere. If you are looking to have a good time and meet a lot of new people, stay here. Beautiful, cozy, and clean place. Such friendly people. Look forward to staying there again. This hostel was a total family! I absolutely loved staying here. The staff did a really great job bringing people together, especially solo travelers. Nevin is super accommodating when you (inevitably) will want to extend your stay. The common patio area is great for chilling in and the neighborhood has a lot of really nice bars/cafes/restaurants. Stay here!! Awesome hostel with awesome staff!!!! The way that the hostel is set up makes it very welcoming and social. It's a fun place, definitely stay here if you want to party. The staff, especially Nev, are upbeat and great people. The hostel itself was excellent including most of its staff. The only problem it was full of Aussies and some of them had serious problem of racism. The staff at Hedonist are so so sweet and the location’s is ideal but unfortunately this is one of the noisiest hostels I’ve ever stayed in. And not because of a party atmosphere - simply because of construction. The building is beautiful and the setup is nice but every sneeze, wheeze, cough and sigh was amplified throughout the rooms (I have really good earplugs too). If you’re a strong sleeper you’ll love it but if you’re even just a medium sleeper I might look elsewhere. Great hostel in the heart of Belgrade. Everything is a ten minute walk away. Hostel employees are totally helpful, chill and laid back. Single complaint is the limited bathroom set up - 2 showers only.